It’s been quite warm here recently. Warm enough that I’ve not been sleeping too well, even with the bedroom windows wide open, and a fan on full blast all through the night. There’s no air conditioning here. What I’ve had to keep my going though is the humble mojito. I love my mojitos. I’d love to blame Bruce Campbell in Burn Notice, but I’ve been enjoying them long before I started watching that show. There’s something about that combination of lime, mint and ice that makes a summer day wonderful. But today I’m not making my normal strained mojito. Since True Blood is returning to our screens, I’ve been thinking about blood related drinks (you know, like you do). I’ve been making raspberry based mojitos for a while now, but I’ve only just realised what a gorgeous deep blood red you can get out of them. So, I decided to tweak my recipe a little bit and make something that really looked like blood. The secret to this is in the double straining. Normally when I strain a mojito I’m left with bits of mint and lime flowing through the drink, contributing to the lovely green colour that I adore. For a drink that you’re wanting to look bloody though, this doesn’t quite work. So, I double strain. As with most things I do, this is really easy. Instead of simply straining the drink, I hold a tea strainer between the cocktail shaker and the glass as I’m pouring. This has a finer mesh than the normal cocktail strainer, and so stops any bits of mint and any raspberry seeds entering the drink. What you’re left with is a very smooth, red drink. Try it; I’m sure you’ll love it. First, squeeze the juice of half a lime into your cocktail shaker. Before cutting the lime, I will roll it hard against a table, pushing down on it as I go. This will smush the inside of the lime a bit, allowing the squeezing process to be a bit easier than otherwise. Once you’ve squeezed the lime, cut the peel up and stick that in the shaker as well, along with the sugar, mint leaves and raspberries (in that order). Using a muddler (or the end of a rolling pin), squish and rotate to puree the raspberries, rip the mint and combine everything together. You can use frozen raspberries if you like. In fact, I keep a stock of frozen blueberries and raspberries in my freezer all the year around for alcohol related emergencies. You never know when you might want a nice cocktail. Add two shots of rum and a couple of icecubes. Shake vigorously. I find that singing a song at this point helps the process. To a separate glass, add enough crushed ice to fill. Now for the straining. Double strain the contents of your cocktail shaker into your glass of ice. So, why am I double straining here? Basically, your shaken mixture will contain lots of raspberry seeds and some shredded mint. Now, whilst the mint would look gorgeous in a normal mojito it doesn’t work too well for the True Blood variety. You want to get rid of all those bits and leave a nice smooth colourful drink. What I mean by double straining is strain normally using your built-in or hawthorn strainer and then immediately through a standard tea strainer. Your normal strainer will stop the lumps of ice and lime from entering your drink, and the tea strainer will keep hold of your raspberry pips and mint. 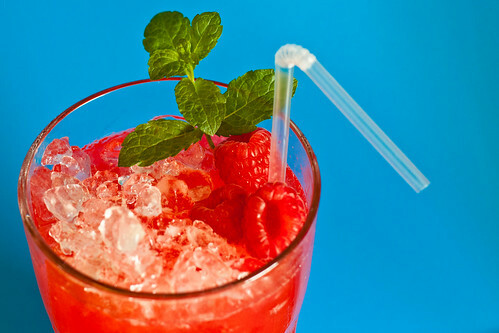 Finally, garnish with a few raspberries and a sprig of mint. Add a straw, and enjoy. What a great twist on the classic mojito!